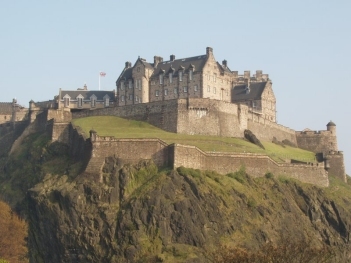 We leave St Giles Cathedral in the High Street and walk up to Edinburgh Castle esplanade. A stroll through Princes Street Gardens, takes us to pretty Dean Village where we follow the Water of Leith to Roseburn. Our Way along an old railway threads us through suburbs to Davidson’s Mains village and between golf courses [Burgess and Bruntisfield] to old Cramond Brig which crosses the River Almond. 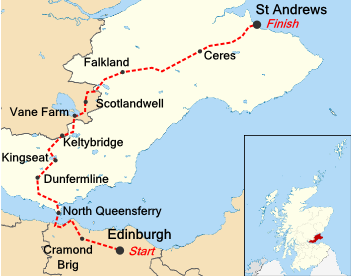 Soon we are on the Shore Path to Queensferry, leading to the Forth Road Bridge and charming North Queensferry with ruins of a chapel to St James, the patron saint of pilgrims.